Wrap each jumbo scallop in bacon. Secure with a toothpick. Sprinkle with honey, lemon juice, and butter. Season to taste. Bake at 350 until bacon is completely cooked. Top with slivers of swiss cheese. Grease a casserole dish. Chop the bacon into pieces. Mix bacon and scallops, top with honey, butter, and lemon juice. Bake at 350 for 10-15 minutes (or until bacon is cooked). Add salt and pepper, top with swiss cheese, and serve as soon as cheese is melted. Both recipes have the same ingredients, and the same amazing taste. They are easy to prepare and full of deliciousness! I am so grateful for an amazing husband who knows his way around the kitchen! 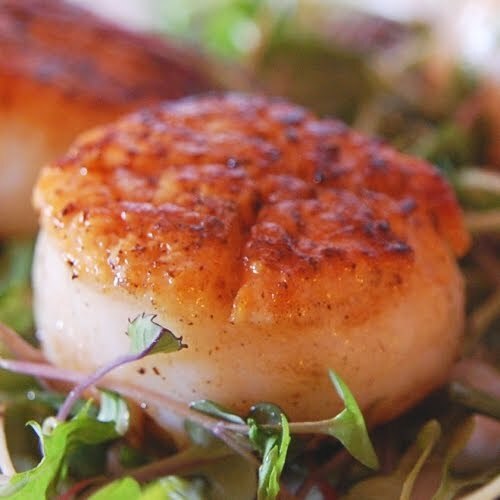 My hubby loves scallops & would think this is awesome. Glad to fnd your blog. Have a blessed Thanksgiving! Hi Bethany! just popping in to say Hi and wish you and Jason a very Merry Christmas! Hi Bethany, I sure have missed your posts! But I am sure your teaching responsibilities fill your time! Thanks for stopping by and leaving your comment. Loads of Happy New Year wishes to you and Jason!